See the first African-American to lead a journal that has the largest reach of any law journal in the world. In it's 130 years of existence, the Harvard Law Review never elected a black woman as president. 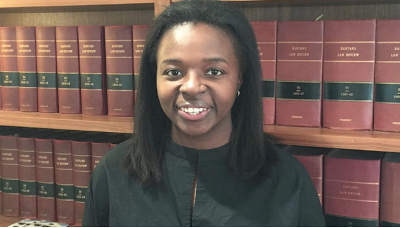 Now, 24 year old ImeIme Umana has changed that as she becomes the first African-American to lead a journal that has the largest reach of any law journal in the world. The daughter of Nigerian immigrants, Umana grew up in Harrisburg, Pennsylvania. She's a joint degree candidate at Harvard Law School and the Harvard Kennedy School of Government. Last summer, she interned with the public defender's office in the Bronx, and wants to serve as a public defender.